It has been some time since I have had a stupid tourist comment of the day, what with working in Portugal and then having some time off in Calabria. Today was my first official stupid tourist comment for 2008 and this is a sure sign that the gates are open and the comments are going to be flowing freely from now on. This morning I went to one of our beautiful 5 star hotels on the Via Veneto (which is a posh part of Rome, with upmarket hotels, shops, embassies etc...) to met some guests. I was greeted by a really lovely, bubbly, friendly lady in her late 30s and her husband. We sat in the plush bar area (which happens to have the biggest chandelier that I have ever seen! I love crystal chandeliers) and we began our chat. L: So what can I help you both with? Well we are in Rome for 3 days and want to see as much as possible, can you tell us where to go? L: There are many places to go, and things to see. Have you perhaps read of some places you would like to visit? L: It is a nice building to see. Oh, ok! Great. And where can I go shopping? 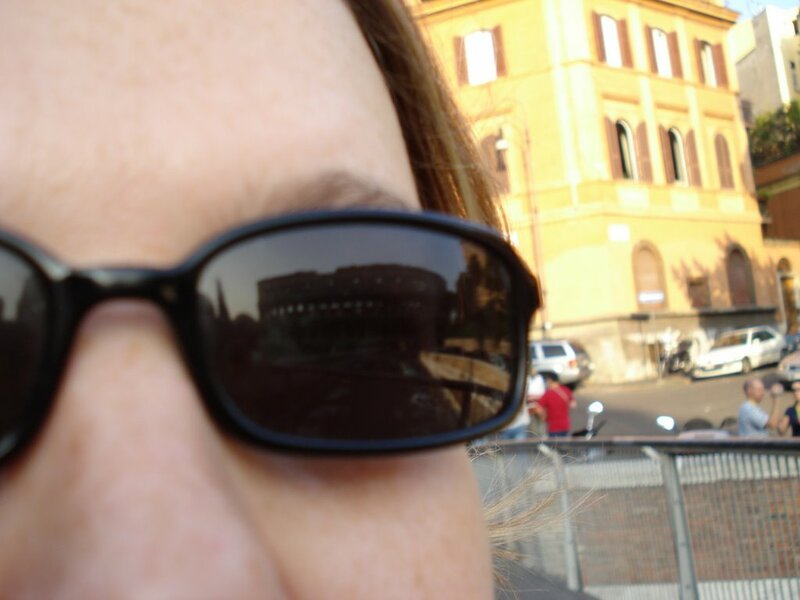 L: This is the Colosseum and this is Fori Imperiali with the ruins of Ancient Rome. Here are some pics when bel ragazzo, my old colleague and I played tourist and took the open air bus around Rome. I often enjoy to take this bus, and better still I do not have to pay for it! Although I work for a British company she was American and her husband was British. And I am sad to say that she is not the first person to have never heard of 'Ancient Rome.' You would think she had at least seen the Gladiator movie -even if it was just to see Russel Crow! Wow- you do get some pretty stupid tourists. "What's ancient Rome?" Why are they here??? The tourists at our B&Bs are generally really bright in comparison. Maybe that's because they're staying at our little places (which are definitely budget options) rather than a 5 star hotel on Via Veneto! You are right Kataroma. Back packers and generally brighter as they save all their hard earned cash to come, and they carefully choose where to go. 5 star people just go as someone probably said their are some nice designer shops in Rome!